A toilet that won’t drain is a major inconvenience. Worse yet, if it’s the result of a serious plumbing issue, it could lead to costly repairs that you’d rather avoid. But knowing what to do if your toilet won’t drain prevents plumbing emergencies and saves you money. The following will help you understand how to fix your toilet easily so that you avoid unwanted plumbing problems. You don’t have to be a plumbing expert to know what causes a toilet to clog. Best of all, with a little bit of know-how, you can get your toilet back to working condition quickly and with minimal effort. The toilet’s rim and jet holes can become clogged over time. These are the toilet’s components that allow water to scour the toilet bowl and make it possible for the toilet’s siphon action to take place. Hard minerals can build up in these holes and ultimately prevent your toilet from flushing properly. This reduces your toilet’s ability to move water into the bowl and compromises its self-cleaning mechanism. In some cases, your toilet may flush at a slower rate, while in others, it may not flush at all. The fill valve of your toilet may also be a factor preventing your toilet from flushing. The fill valve regulates the amount of water that enters the toilet’s tank. A valve that’s no longer working causes the toilet to keep running and prevents it from flushing. Damaged components or incorrect settings can cause this problem to occur in many cases. Many toilet issues are the result of a clogged toilet drain. This can be easily addressed with a plunger. Using a plunger allows you to create a seal that makes it easy to unclog your drain. 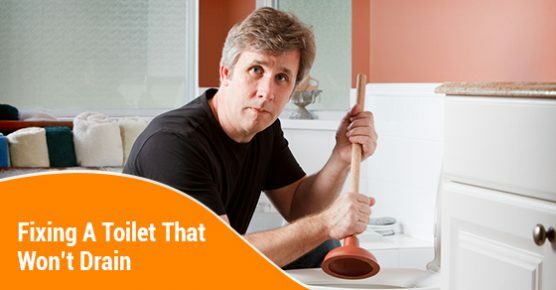 A plunger can typically solve most toilet issues that involve a clogged drain. If the water fills to the top of the tank after flushing, wait until it drops a bit and use a plunger to clear the drain. In same cases, a standard toilet plunger may not be enough. You may need to use a plumbing snake for hard-to-clear drains. This plumbing tool consists of a long coil that’s fed into your toilet’s drain. The snake has a tip that can be screwed into the debris clogging the pipe. This makes it easy to break it up and allow water to flow through the drain. There are different plumbing snakes available, and consulting with a plumbing expert can help you determine which will be the best one for your needs while protecting your toilet. There are a number of factors that can cause your toilet to clog. A toilet that won’t flush can lead to other issues. More importantly, it can lead to more costly repairs if left unaddressed. Knowing how to address a toilet that won’t flush keeps your home’s plumbing system running smoothly. Consulting with a skilled plumbing service helps you determine the best options so that you do the job right.